Move over Dr. Spock, here come the Calamari Sisters! 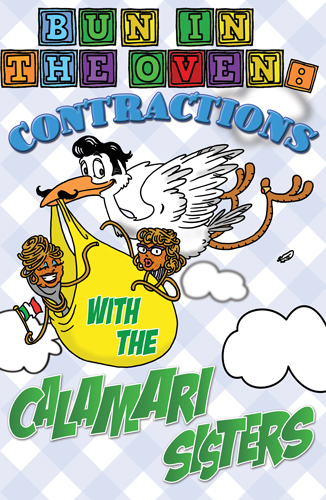 Join the sisters, once again, as they prepare to celebrate the newest addition to the Calamari family. Delphine and Carmela are in rare form, catering the biggest bouncing baby shower Brooklyn has ever seen. There’s no stopping this duo of singing, dancing, and cooking Italian Mamas from belting out tunes such as “You Must Have Been A Beautiful Baby,” “Mama,” “High Hopes,” “Rainbow Connection,” and “Banana Split For My Baby.” Lamaze will never be quite the same once the Calamari Sisters get done with it!